VistaPrint offers graphic design services and printed products via its web site. I ordered business cards from VistaPrint 32 days ago. Just after the cards arrived, I posted about them. 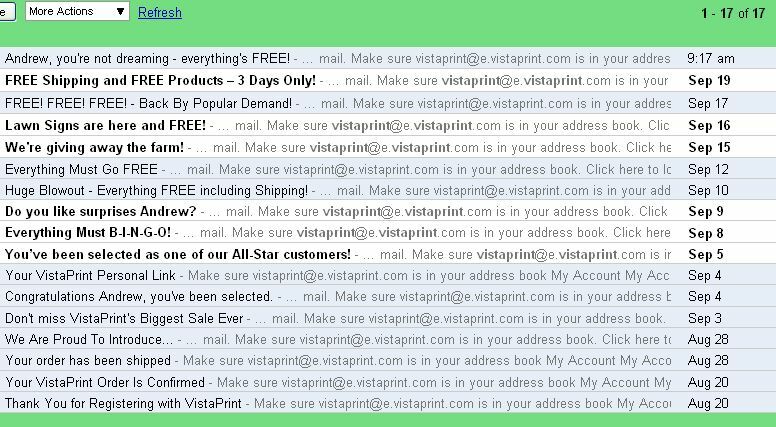 In the month or so I’ve had a relationship with VistaPrint, I’ve received 17 emails. Almost all of them have been yells about what a cheap deal I can get: FREE! Everything must B-I-N-G-O! Lawn Signs! Giving away the farm! (as well as the lawn). None of the 17 emails have asked me about the quality of the business cards. That gives the impression that the tagline “Best printing. Best price” is truer about the price than about the printing. The impression is reinforced by the thin white stripe down the side of the cards. Although there is a “satisfaction guarantee,” there was no prominent reminder of it in any of the emails, and as far as I can tell from the web site, there is no online means of reporting problems. Allowing problems with printing to be reported online. Providing a forum for customers to share their designs, comment on each others designs, etc. This is particularly relevant for customers like me, who uploaded their own graphics and did their own layout. Sending fewer emails about SALE!s. If I get one such email every other week, I get the idea: there’s pretty much always a sale. And I’d rather get one every two weeks than three every week. Monitoring the web, and, in particular, the blogosphere, for posts such as this, and commenting on them. Having said that, I’m not unhappy that I went with VistaPrint for my buisiness cards. See the previous post to see the design. Feel free to comment, at that post, at this post, or anywhere or anyhow else, on the design and how it might be improved for any future printings – at VistaPrint or elsewhere. May i reccomend XpressPrint – Quality Anyone Can Afford! for your quality printing. We’re a new company and would love to earn your business. For superior quality Full Color Pocket Folders or Premium Business Cards visit XpressPrint-Online.com. They offer one of the best prices on the internet and offer the ability to print just about anything you can design. I can’t see my postings. Your comment was flagged as spam – and I can see why – but I rescued it. I definitely agree on your points about VistaPrint. I recently decided to switch to http://www.paperdirect.com, and have had great luck with them so far. Large selection of products, competitive prices, and most importantly fantastic customer service. I’d check them out if you’re looking for a change. Vistaprint is terrible. I used their template for a custom designed business card. Three times I went back and forth with their customer service. All three times Vistaprint screwed up the job. Don’t waste your time and money. Vistaprint is absolutely the worst.